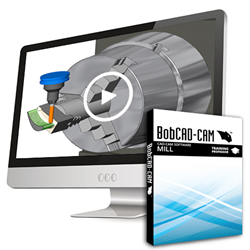 BobCAD-CAM, Inc. announced today the release of the popular CAD-CAM video training series for their newly launched CNC mill programming and CAD design software. These videos are an effective way for designers and programmers to expand their CNC programming skills and increase their business’s bottom line. BobCAD-CAM, Inc. announced today the release of the popular CAD-CAM video training series for their newly launched CNC mill programming and CAD design software. This marks the company’s first training set that covers the new Version 28 CNC software, which debuted in July 2015. The Training Professor Video Series offers how-to instructions on using the new features available for CNC mill programming and CAD design in addition to the innovative features that BobCAD-CAM has developed over the past 30 years. This includes a wide array of CAD design tools, the software’s wizard driven interface, Dynamic Machining Strategies™, 2-5 axis high speed adaptive toolpaths, simulation features, reporting tools, and much more. Both Mill and CAD Training Professor Video Series products are available for purchase from the BobCAD.com Store Page. Interested parties can contact a BobCAD-CAM representative directly for more information (877) 262-2231 x123. Demos of the new Version 28 and Mill Turn module are available for immediate download from BobCAD.com.